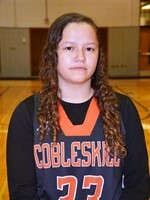 COBLESKILL - The SUNY Cobleskill Fighting Tigers women's basketball team roared into the 2016-17 season on Tuesday night, beating the favored MCLA Trailblazers 66-60 in non-conference Division III play at home. Led by an impressive breakout 20 point debut by Freshman guard Addy Lawson, the Fighting Tigers squeezed out the victory just hours after placing sixth in the North Eastern Athletic Conference (NEAC) pre-season Coaches Poll. Buoyed by an improved 9-16 record last year and the return of several starters, hopes are high for the women's squad heading into Katherine Kollar's second-year as head coach. Hopes that remain high following Tuesday's promising tip-off to the new season, in which the Fighting Tigers struggled early on to gain the upper-hand against the Trailblazers before coming out on top. Trailing 18-6 with under four minutes to go in the first quarter, SUNY Cobleskill clawed their way into a 23-18 lead midway through the second quarter on the efforts of Lawson, who scored 11 of the Fighting Tigers 17 points over the eight minute run. Tied at 28 each at the half, the Fighting Tigers were able to gain the lead early in the third quarter and maintained it throughout the remainder of the contest. Senior guard Ashley Creighton and Freshman forward Shaliyah Graham largely carried the squad in the second half, with Graham scoring key baskets late in the waning seconds of the fourth quarter. Team Captain Shelby Preston scored 7 points and earned 11 rebounds overall. The Trailblazers were led by Senior guards Courtney McLaughlin and Ashley Clawson, who scored 20 and 13 points respectively in MCLA's defeat. SUNY Cobleskill be on the road next, competing in the 2016 Hunter College Tip-Off Tournament this weekend. They return home to face the Southern Vermont Mountaineers on Tuesday, November 22nd at 7:00 p.m.